The bar was set high for Ryan Murphy’s “American Crime Story” series that began two years ago with the remarkable retelling of the O.J. Simpson Trial. 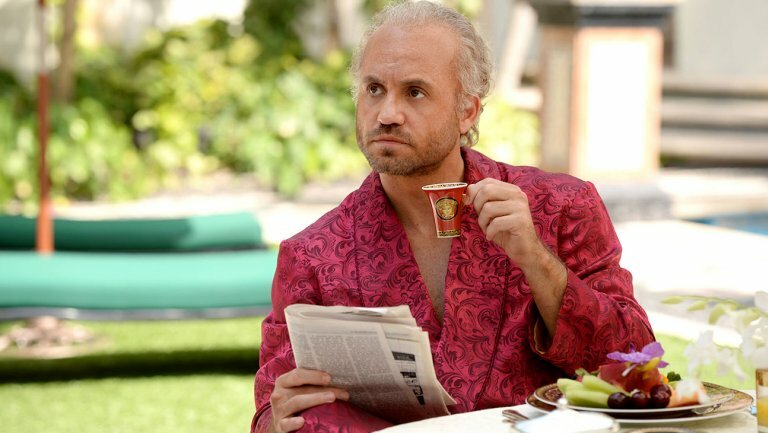 Although a lesser known crime, with a less direct social point to make, the new “The Assassination of Gianni Versace: American Crime Story” (FX, 10 p.m.) also has a stellar and sometimes surprising cast, matched with exacting sets and production. Following the shooting of the design icon, played in an understated way by Edgar Ramirez (“Carlos”), the story reels back to the four murders that led up to it by the maniacal Andrew Cunanan, chillingly played by Darren Criss (“Glee”). Penélope Cruz plays Donatello Versace; Ricky Martin plays his lover. Along the way, there’s a point to be made about gay panic in the 1990s. [Here’s a longer story I’ve written about the series for Smithsonian Magazine.com]. Murphy’s other recently debuted series, the very different procedural “9-1-1” (Fox, 9 p.m.) has done well enough for it to have been already renewed for season two. “Corporate” (Comedy Central, 10 p.m.) is a new series that takes an especially dark look at the workplace, written and starring Jake Weisman and Matt Ingebretson. The cast also includes Lance Roddick of “The Wire” and the comic Aparna Nancherla. “We found that a lot of office comedies that we’ve seen in the past portray the office as, sort of, a fun, hi-jinxy, sort of, environment,” Ingebretson told reporters at the TV Critics Association winter press tour, “and we wanted to our experiences working at jobs like this were that they were soul crushing and nightmarish, and we wanted to try to find the comedy in that and dig into the darkness versus shying away from it.” [More of my reporting from the press tour can be found here]. A third season starts for “The Path” (Hulu, streaming), about a troubling cult. Freda Pinto is added to the cast that includes Aaron Paul, Michelle Monaghan and Hugh Dancy. The once familiar face of Tabatha Coffey, the short-haired, tough-talking advisor, returns for a new show advising family businesses of all types, “Relative Success with Tabitha” (Bravo, 10 p.m.). A new documentary tries to be “Understanding the Opioid Epidemic” (PBS, 10 p.m.) by looking at some hard hit communities. Jughead returns to “Riverdale” (The CW, 8 p.m.) and Betty looks for her brother. A new “Nature” (PBS, 8 p.m., check local listings) follows a group of the Arctic Wolf Pack. Luke goes missing on “Modern Family” (ABC, 9 p.m.). Ghosts overtake Civil War reenactors on “The Librarians” (TNT, 8 p.m.). Twins are a problem on a new “X-Files” (Fox, 8 p.m.). “The Amazing Race” (CBS, 8 p.m.) travels to Morocco. On the winter return of “Dynasty” (The CW, 9 p.m.) Crystal tries to recharge her wedding. “The Real Housewives of New Jersey” (Bravo, 9 p.m.) begins its reunion episodes. Red looks for treasure on the 100th episode of “The Blacklist” (NBC, 8 p.m.) that features a guest appearance by Nathan Lane. “SEAL Team” (CBS, 9 p.m.) disobeys orders so they can save Clay. The team on “Criminal Minds” (CBS, 10 p.m.) go to Central Park. On “Chicago P.D.” (NBC, 10 p.m.), Atwater disappears at the home of a felon. Zoey arranges to be tutor to the college’s star basketball player on “Grown-ish” (Freeform, 8 p.m.). Beni has a birthday on “Alone Together” (Freeform, 8:30 p.m.). An airline captain is accused of sexual assault on “Law & Order: Special Victims Unit” (NBC, 9 p.m.). On “Vikings” (History, 9 p.m.), tragedy unfolds in Floki’s camp. Eliot goes on a quest on “The Magicians” (Syfy, 9 p.m.). Katie and Greg try to chase off Taylor’s new boyfriend on “American Housewife” (ABC, 9:30 p.m.). There’s a woodshed incident on “The Goldbergs” (ABC, 9 p.m.). A mysterious woman emerges on “Knightfall” (History, 10 p.m.). Maya decides to run her own home school on “Speechless” (ABC, 8:30 p.m.). “Happy!” (Syfy, 10 p.m.) finds another imaginary friend. A stormy night is expected on “Full Frontal with Samantha Bee” (TBS, 10:30 p.m.). Josh follows treasures mentioned in “The Secret” on “Expedition Unknown” (Travel, 10 p.m.). Adam Pally, Cheryl Hines, Ron Funches, Caroline Rhea, Mario Cantone and Ana Gasteyer play “Match Game” (ABC, 9 p.m.). It’s all about 12 O’Clock on Turner Classic Movies with “Chimes at Midnight” (8 p.m.), “Midnight Lace” (10:15 p.m.), “That Midnight Kiss” (12:15 a.m.), “Midnight Express” (2:15 a.m.) and “The Horn Blows at Midnight” (4:30 a.m.). Men’s college basketball includes Tulsa at Temple (ESPNews, 6 p.m.), Villanova at Georgetown (Fox Sports 1, 6:30 p.m.), Dayton at Saint Joseph’s (CBS Sports, 6:30 p.m.), Arkansas at Florida (ESPN2, 7 p.m.), SMU at Wichita State (ESPNU, 7 p.m.), Houston at Tulane (ESPNews, 8 p.m.), St. John’s at Xavier (CBS Sports, 8:30 p.m.), Seton Hall at Creighton (Fox Sports 1, 8:30 p.m.), Iowa State at TCU (ESPNU, 9 p.m.), Nevada at San Jose State (CBS Sports, 10:30 p.m.) and Fresno State at San Diego State (ESPNU, 11 p.m.). NBA games include Lakers at Oklahoma City (ESPN, 8 p.m.) and Denver at Clippers (ESPN, 10:30 p.m.). Hockey has Montreal at Boston (NBC Sports, 7:30 p.m.) and Pittsburgh at Anaheim (NBC Sports, 10 p.m.). Second round play continues in the Australian Open (Tennis, 7 p.m.; ESPN2, 9 p.m.). Figure skating has its European championships (NBC Sports, noon). Kelly Ripa and Ryan Seacrest: J.K. Simmons, Darren Criss. The View: Jeremiah Brent, Alicia Menendez. The Talk: Allison Janney, Scott Evans. Harry Connick: James Brown, Rick Springfield. Steve Harvey: Ashley Graham, cast of “Mancave.” Ellen DeGeneres: Sarah Jessica Parker, Camila Cabello. Wendy Williams: Jerey Parsons, Stephanie Harris-Uyidi, Dan Harris. The Real: Caleb McLauglin. Stephen Colbert: Ricky Gervais, Matt Czuchry, Jon Bon Jovi. Jimmy Kimmel: Bill Maher, Lauv. Jimmy Fallon: Savannah Guthrie, Hoda Kotb, Edgar Ramirez, French Montana. Seth Meyers: Sean “Diddy” Combs, Luke Evans, Nicole Sullivan, John Stanier. James Corden: Kyra Sedgwick, Ed Helms, Lena Waithe, Stefflon Don. Carson Daly: Willem Dafoe, Vance Joy, Wheeler Walker Jr. (rerun). Trevor Noah: Anthony Bourdain. Jordan Klepper: Matt Gertz. Conan O’Brien: Molly Shannon, Aaron Sorkin, Mo Welch.